'Creating beautiful outdoor spaces for people to enjoy is very rewarding. The purpose of this blog is for me to share some reflections on our work and our industry with you. Your comments and views in return are very welcome indeed'. This entry was posted in Blog on March 14, 2019 by admin. What have you learnt from your job over the years? I’ve been leading and managing The Garden Company since 1991 and recently I have found myself reflecting on what this has taught me. These ‘learning points’ happen to be set in the context of a garden design and build business, but I strongly suspect they are applicable to any small service firm – architects, consultants, accountants – let me know! We provide a high-end, bespoke landscape design and build service; we aim to ‘wow’ our clients, who may be residential garden owners or commercial organisations, schools, hotels …. Sometimes, we have two clients to ‘wow’ – the garden/site owner and also a fellow designer (where we build to their design, not our own). With all of this in mind, it can still be surprisingly easy to fall into the trap of focusing on what we want to deliver rather than listen to what the client really wants. So … the first learning point I want to highlight is that designing and building gardens isn’t about our wants and needs, it is about those of the client. What do they want from their garden or grounds? What are their aspirations? How do they want to use the space in future? Of course, we can add a lot of value when it comes to solutions (that’s why we’ve been chosen! ), but we need to start from a very good grasp of the project’s starting point and the desired outcomes. We have learnt over the years to listen intently to the client from the beginning and all the way through a project. Our marketing materials speak about our clients, their stories and aspirations, not what makes The Garden Company great. A bit of a cliché maybe, but so true in my view. Any good project manager knows the importance of mise en place, a French term which translates to “putting in place.” This is the work that begins in the restaurant trade long before a meal is due to be served. Chickens are portioned, vegetables are peeled, sauces are prepared. It is certainly not exciting work, but it is essential for a high-quality service and it reinforces the need for people to take pride in their work at all stages. We hold this principle very dear at The Garden Company and we have invested significant time and resource into making sure that projects are planned and delivered effectively and efficiently. We have captured our approach to this in both our Landscape and Maintenance teams by writing down a set of Standard Operating Procedures (SOPs) for all team members to follow. The overall purpose of each SOP is to give detailed directions so that any individual can do a job correctly, on time, every time. They are great training (and cross-training) tools and we are glad we took the time out to document them. Soon after setting up The Garden Company, I realised that to scale the business up I needed to develop individuals and teams to be able to help me to deliver our services. However, delegation has been one of the hardest lessons to learn because – even now – in such a competitive industry, every opportunity feels a little like gold dust. Once I have delegated a task, I know that I can neither ‘abdicate’ nor can I interfere – so I’ve learnt to keep things on track by making sure that I have shared any information about the delegated task that I already have, by communicating regularly and agreeing interim steps, deadlines and progress reviews. But it’s a work in progress and for the full picture, ask the rest of my management team how this is going! Of course, the alternative – trying to keep doing everything myself – is not sustainable. Leading and managing my own small business has taught me to appreciate value of good team work in practice. As company owner and manager, there have been days when I’ve not been quite sure how I’ll get everything done – perhaps it’s the big finish on a project in time for a client’s garden party, along with a proposal presentation to be prepared and a new design waiting for my attention on the drawing board – these situations are challenging, but they do reinforce the message: on your own, you’d never meet all the requirements made of you. Together, through genuine collaboration and cooperation, teamwork can really save time, make great use of the talent available and deliver fantastic client service. · applying some good old stress-management techniques – for me, it’s about getting good quality sleep, eating healthy food, taking exercise, relaxing with the family and/or my guitar, walks in the fresh air enjoying my surroundings (remembering why I do what I do!). I think it’s well-recognised that time away from the ‘coalface’ can often be the time that new ideas come to the foreground. Creating beautiful gardens for a living is highly rewarding in itself, not least because every project is unique. Every new project needs to be based on a robust thought process together with a sprinkling of design creativity and inspiration. In my January blog, I wrote about the factors that have most influenced my design work over the years and the satisfaction to be gained from creating a space for people to enjoy. I am always impressed at RHS Shows and elsewhere by the creative talent in our industry and the opportunities to be creative that come our way. I’m so grateful to remain highly motivated by this and not ever feel stifled by my job! It’s clear to me why many people switch into second careers in this industry because of the opportunity to be creative and work with nature, compared to so many deskbound professions. As a garden builder as well as designer, I’ve worked closely with other designers over the years – building gardens to their designs and interpreting their concepts as sensitively as possible has been a great additional source of creative energy and inspiration for me. It’s not exactly a learning point, but the golden thread through all of my ‘rambling’ here is that we are a friendly bunch in garden design and construction! Sure, it’s a highly competitive world, but at least it is friendly competition. In my view, the work just attracts nice people (!) – I’ve written before about how much I enjoy being immersed in this industry. It would be easy to take this for granted. A good example of the positive culture that we work in can be found in the support that many give to industry charities such as Perennial and Greenfingers. More selfishly perhaps, as a member of the Society of Garden Designers and the British Association of Landscape Industries, I can honestly say that I have met lots of lovely people through these organisations. Otherwise, I can see how being owner-manager of a small business could be a lonely place to be. So, while most (maybe all) of the points listed are well-established in theory, I believe that it is my personal experience of leading and managing The Garden Company that has driven them home for me. If you are a business owner, what would you add from your own experience? I’d be very interested to hear – whether you are new to the industry, or in the middle and later years of your career …. or from a different industry altogether! Please do comment. And if what I have said here about life at The Garden Company resonates with you personally and you are looking for a new challenge – we are always on the lookout for people who are passionate about beautiful gardens and want to ‘wow’ clients … please get in touch. ‘It must be lovely to be a garden designer and create all those beautiful spaces for people to enjoy’. People have said this to me many times over the years and it is of course very true. Designing gardens is extremely rewarding, not least because every project is unique. Every new project needs to be based on a robust thought process together with a sprinkling of design creativity and inspiration. So, where do the design ideas for each new opportunity come from? I’ve been reflecting recently on my own design process and this blog post lays out the factors, people and places that influence me the most. For those of you that are fellow designers, I would be interested to know about your personal influences and sources of inspiration. For those of you that are in search of a professional garden design service, I hope that this gives some insight into how we approach garden design at The Garden Company. Looking back to my earliest memories of being outdoors, I have realised how fortunate I was to grow up immersed in the beauty of the Cotswolds. My brother and I had a 2-mile walk to school through woodland and we spent a lot of time happily exploring. My grandparents lived in a 1-acre plot with a somewhat overgrown garden and orchard – it was a place of excitement for children! While my brother and I would often play games or climb trees there, just as often we would help with pruning or fruit picking. Although I didn’t realise it then, I was engaging with nature every day. Now I am very aware of my attempts to recreate those feelings and emotions when designing gardens. I’m often aiming for a certain atmosphere, a ‘sense of place’, a garden that doesn’t just look good but feels good too – overall, a relaxed and comfortable feeling. When I was first studying garden design, the designers that most influenced me were those such as John Brookes, Robin Williams and Geoffrey Jellicoe. They were very active at the time, with exciting schemes, stunning show gardens, and inspirational books. I still dip regularly into their books on my office shelves – Geoffrey Jellicoe’s ‘Private Modern Gardens’ is a wonderful source of ideas. More recently, leading garden designers including Cleve West, James Basson, Tom Stuart-Smith and Christopher Bradley-Hole have been a big personal influence. Their show gardens have left a lasting impact on me and added to my mental ‘bank’ of ideas. As a garden builder as well as designer, I’ve worked closely with several designers over the last 25 years, including Debbie Roberts and Ian Smith at Acres Wild, also Julie Toll and Andrew Wenham in Hertfordshire. Building gardens to their designs and interpreting their concepts as sensitively as possible has been a great source of insight into their creative thinking. We are so lucky in the UK to be able to visit some truly outstanding gardens and flower shows. Early on in my design career, I was really influenced by Hidcote Gardens in Gloucestershire, a well-known Arts and Crafts garden. I was struck by the series of outdoor ‘rooms’ and the atmosphere this generates. Along with many of my fellow designers, I visit Chelsea Flower Show every year, usually spending a few days there during Chelsea week, to immerse myself in as many ideas and schemes as I can – from design concepts to the finer finishing details. I also enjoy the National Garden Scheme, a great opportunity to view gardens not normally open to the public. My advice to garden design students is always to make sure that they are exposed to as many influences as possible. Often I find myself looking for a design solution to a certain set of ‘problems’ and the main source of ideas is the collection of experiences that I’ve had before. It’s vital to expose yourself to as much creativity as possible – so that when your mind is working on a design concept, you’re more likely to come up with a better solution. Of course, being inspired and influenced by what I’ve seen can apply to many things beyond garden design. Very often, I get my ideas from nature – the atmosphere created by an old tree surrounded by low level planting, or natural colonies of plants. Even the layout of agricultural land can be aesthetically pleasing. Abstract art can be a great demonstration of the relationship between certain proportions, geometries and colours. A simple image can be a reminder that certain proportions and balances are pleasing to the eye – Piet Mondrian’s pieces based on squares and rectangles and Wassily Kandinsky’s work on the ‘harmony of colours’ are examples of this. In terms of architecture, I value Frank Lloyd Wright’s legacy, especially for his sense of balance and proportion and the blending of buildings into the landscape. Rarely were his buildings imposed on the landscape. It’s a shame he never came to the UK because it would be wonderful to have more access to his work. There are trends in garden design as in all creative work. I don’t think I really follow them – although I am influenced by them and sometimes actively avoid them! Being heavily involved in the British Association of Landscape Industries and the Society of Garden Design helps me and my team to stay up-to-date and able to anticipate what clients might be considering. The other side of the same coin is that garden design is quite timeless. The end of a design project is the start of a long process of nurturing a garden to its full potential and – although obviously we introduce new products and materials as appropriate – in the main we are designing with a long-term vision in mind. I’ve commented here on a wide range of ideas and experiences that influence my approach to each new garden design project. I think this reinforces what a highly subjective process garden design is – it’s certainly hard for me to imagine a time when the type of bespoke service that we provide to our clients will be automated. I hope that these reflections have been interesting to my fellow designers, to clients – old and new! – and to people interested in creativity generally. Please do share your thoughts by commenting as shown at the top. If you would like to know more about our current and recent design work, then please see my updates on Instagram (@thegarden_company) and Twitter (@gardencomp). Merry Christmas from The Garden Company! This entry was posted in Blog on December 20, 2018 by admin. The Garden Company team is grateful for another successful business year and very happy to send a Christmas donation once again to Perennial, the charity dedicated to people who work or worked in horticulture and are facing tough times. We know that this wonderful charity makes a real difference to peoples’ lives and we are proud to be a Perennial Partner. Building lots of exciting projects, both to our own designs and for other professional designers too. We’ve been very busy, and we know that our culture of quality and teamwork has been vitally important. 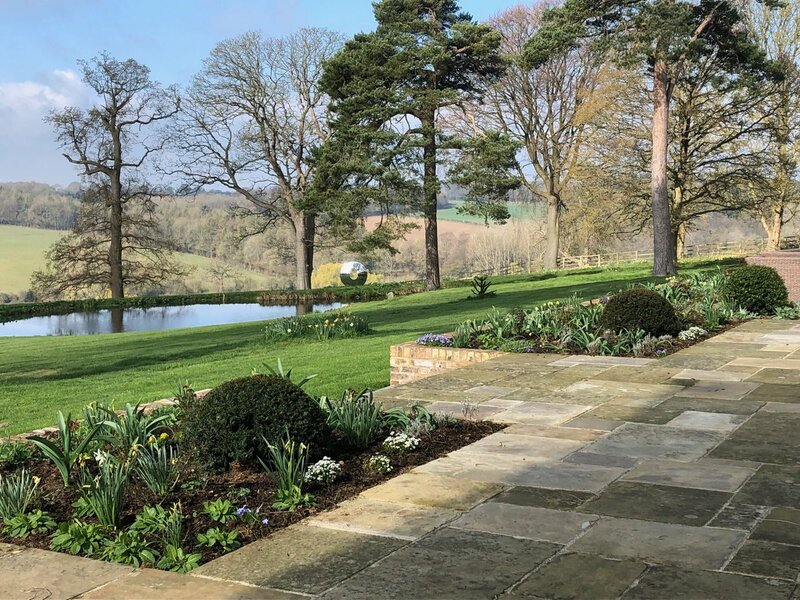 On one memorable day we mustered a Garden Company team of around 12 of us to plant up a scheme in Sarratt in Hertfordshire – a beautiful location with views over the Chess Valley (and luckily the rain stayed away!). Finding out that The Garden Company has been shortlisted for two SGD (Society of Garden Design) Awards. Now in their seventh year, the SGD Awards are designed to recognise and reward outstanding achievement in the garden design profession. They are the only Awards dedicated solely to landscape and garden design in the UK. Being nominated as finalists is wonderful recognition not just for our own teams but also for our suppliers – and so a special mention and thank you to London Stone, CED Natural Stone, Coles Nurseries, Rochford Gardens, Greentech Ltd and JC Wildflowers. We are looking forward to a great night out at the Awards Ceremony on Feb 1 next year, whatever the results! The shortlisted Garden Company projects are Laurel Cottage in Northwest London and The Threshing Barn in Hertfordshire – pictured below, with more images and information available on our website. Looking ahead to 2019, we have plans to grow the business further and ‘hit 2020 running’ in 12 months’ time – this will make our focus on quality, staff development and great communication with clients and business partners more important than ever. I would like to close with a huge personal thankyou to our valued Garden Company clients, team members and business partners for your continued support and loyalty throughout 2018. And – of course – we wish everybody a fantastic Christmas and a happy, healthy New Year! If you’re looking for landscape design services for next year across the UK – or are based in the South-East and need construction or aftercare/maintenance services, we’d love to hear from you on 01442-832666. How can we help people to understand landscape and horticultural services better? This entry was posted in Blog and tagged garden design, gardens, horticulture, landscape, landscaping on November 29, 2018 by admin. I watched a recent episode of The Apprentice with increasing exasperation – and almost switched off altogether. Very wise, those of you that generally avoid reality TV might be thinking – but my reaction was nothing to do with the ‘falseness’ of a reality TV format, it was all to do with the misleading image that was portrayed of our landscaping and horticultural industries. As the programme format dictates, two teams of young business people were set a task by Lord Sugar. The teams were briefed to set up their own urban gardening businesses, carrying out commercial and domestic jobs across London. On day one, both teams visited corporate clients to pitch a plan and secure a price for a large rooftop renovation. On day two, the work was carried out and client feedback was given. The outcomes were not good. One client was presented with a badly-painted bench and various plants randomly scattered about the space (she did not pay up). Overall, the picture was one of shoddy work and despite our heritage as a nation of garden lovers and years of popular TV gardening programmes, it seems that we still have difficulty portraying the services offered and the skills deployed by those working in landscape and horticulture industries accurately and positively. Issue 1 – how can we expect to attract people into landscape and horticulture roles if the work is so misunderstood and undervalued? With Brexit on the horizon combined with an ageing workforce, employers and managers across landscaping and horticulture are faced with an ever-more challenging ‘war for talent’ and urgent skills shortages. Issue 2 – how can we expect our clients to appreciate the ‘value-add’ in our services, if it is seen as such low-skilled, low-budget, quick turnaround ‘stuff’? The Apprentice contestants were actually on a hiding to nothing – it was completely unrealistic of the producers to expect them to do justice to the roof garden projects with the tiny budget allocated and a few hours to carry out the works. I am sure I would have been unsuccessful too in their shoes! In the real world, there is some good news with regard to attracting new talent to the industry. I know in my role as MD of The Garden Company that there are a number of hugely talented young people already enjoying early success. Last week, I enjoyed attending Pro Landscaper’s presentation of awards to the Next Generation 2018: 30 under 30. This is a wonderful initiative that seeks to recognise and reward the achievements every year of 30 inspiring young people in our industry. The youngest winner this year was only 21 and the range of roles encompassed by the group was inspiring in itself, including landscapers, garden designers, maintenance services, landscape architects, arborists and suppliers specialising in technical products. It’s great that Pro Landscaper is driving this forward, and of course there are other initiatives that share the goal of inspiring more young people – I would like to give special mention to BALI’s Golandscape and the Landscape Institute’s #ChooseLandscape career campaigns, along with the Green Plan It challenge for schools led by the RHS. However, with regard to the TV programme makers, the media and the wider public’s perception of what we do and how we do it: there seems to be very long way to go to get people ‘on side’. Of course, every time we talk to prospective clients we need to demonstrate our value and results, and help people to appreciate the range of disciplines that we draw on – design, hardscaping, softscaping, horticulture, planning regulations …. I could go on! I have always seen this as part of the ‘day job’ – but I would love to think that it could be made easier in future through a wider understanding of our services. What else can we each start doing (or do more of) in our ‘day jobs’ to address both the skills shortages and the general lack of insight into our services? Education, education, education - We need to keep shouting out about how rewarding it is to have a career in landscape design, construction and horticulture … to schools, colleges and anyone with an influence on shaping young peoples’ career choices and aspirations. By helping to reassure doubtful parents, teaching staff and careers advisers then we can show school-age children what the industry is really all about in the 21st century – and its advantages over other jobs and career paths that may be in decline. I always to try respond helpfully to any requests for information/careers guidance etc from education providers, but it strikes me that I could also ‘push’ for the opportunity to do so. Create opportunities for work placements/internships. A common complaint within British businesses is that colleges and universities do not prepare their graduates for the real world. Our industry is no exception – new job starters need to be ready to work in challenging situations, for discerning clients, applying the skills and knowledge that employers reasonably expect them to have. A vital ingredient here is the availability of work placements and internship. We are delighted to offer 2-3 students a paid work placement every summer at The Garden Company and we are just starting to explore design placements as well as more operational site-based roles. Promote apprenticeships. Real apprentices (unlike Lord Sugar’s candidates!) carry out real jobs while they study, learn and acquire relevant skills and knowledge. Many employers use apprenticeships to upskill existing workers as well as providing training for new employees. At the Garden Company we have benefited greatly in the last few years from ‘growing our own’ team members and team leaders through our own apprenticeship programme. We aim to do a lot more of this going forward. In summary, the recent Apprentice episode illustrated a couple of very real business challenges for providers of landscape and horticultural services (although not the ones that the programme makers intended). We are lucky to have various trade associations, societies and others working hard on our behalf to address both the ‘war for talent’ and our industry’s professional reputation. Those of us that are ‘oldies’ with years of experience of fighting these two familiar battles must continue to play our role – I hope this blog post has prompted some ideas about where we can build on our efforts … your thoughts and comments of course are very welcome. This entry was posted in Blog, Uncategorized on June 18, 2018 by admin. Over the past few months, you may have heard or read about the Repton Exhibition at Woburn Abbey. Maybe you have visited it yourself or you are planning to do so – if it’s within travelling distance that is! I’m in the fortunate position of living only 10 minutes away from Woburn, and I spent a day there recently in the company of my good friend and fellow landscape designer Andrew Wenham, and Andrew’s two brothers. The three siblings had decided to make a trip there as they grew up in Woburn (where their father was the vicar), immersed in a very English landscape. It was really a ‘day of two halves’, sandwiched nicely (ha!) with a pub lunch in the middle. We began by revisiting some of the Wenham brothers’ childhood haunts and spent the rest of the morning at the Repton Exhibition before visiting more childhood places in the afternoon. For me, the entire day reinforced a long-held view that the landscape in which you grow up (be it natural or built) has a huge influence on you. I’m not sure I should be too specific about the morning’s escapades – bearing in mind that we were retracing the steps of three young boys let loose in the countryside. Let’s just say that it involved some wall-climbing, stinging nettles, scraped knees and at one point hiding from a Woburn gardener who may have felt the need to set us back on an official pathway (average age of our group was around 52!). The highlight though was to find our way to a ‘secret’ lakeside, with a view over to an island which the ‘boys’ had believed many years ago to be their own private retreat. The brothers were rather disappointed to find there is now a bridge to the island which curtailed the more exciting plan of making Andrew walk across fallen branches to get there! As children they were completely unaware that they were playing in a built ‘Repton’ landscape. The whole experience conjured up a great feeling of adventure, fun and a slight sense of risk. I thoroughly enjoyed the Repton Exhibition itself, which is being held to celebrate his bicentenary. Generally recognised as the first person to use the title ‘landscape gardener’, Humphry Repton regarded himself as the rightful successor to Capability Brown. A prolific designer, he produced over 400 designs and schemes for gardens and – of these – he stated, “none were more fully realised than at Woburn Abbey”. I found it fascinating to view part of the Woburn Red Book, one of Repton’s largest works, containing detailed designs covering the approaches to Woburn Abbey, the lakes and plantings in the surrounding parkland and the formal Pleasure Grounds. This gate creates intrigue and invites exploration. The present Duke and Duchess of Bedford have been restoring many of Repton’s designs over the last 14 years and following our exploration (after relatively recent discovery in their library) of Repton’s papers and design artefacts, we spent time outside enjoying the folly grotto, the Cone House, the menagerie and the beautiful Chinese-style pavilion. What stood out to me above everything else was Repton’s vision of the garden as an outdoor living space or room to be enjoyed. This is in contrast to the work of Capability Brown who tended to bring a very natural landscape right up to the house. Although it is over 200 years since Repton developed his designs, his work seems hugely relevant to our work today in landscape design, with his focus on blending a house into its landscape, on compartmentalisation of spaces around the house and then a gradual shift into more naturalistic styles further away from the buildings. I think this is a design principle that holds strong today. For this reason, I do think he has more influence on contemporary design than Capability Brown. On a more tactical note, I was also interested in Repton’s emphasis on presentation – his Red Books are famous throughout the design profession and I could relate to the need to ‘wow’ clients at the same time as providing sufficient technical information to enable the work to be done. As well as an enthusiastic salesperson, Repton came across as having quite an ego, he certainly did not take well to having his schemes rejected – I can’t think how that applies to our profession today… (!). I was also struck by one of his quotes: ‘beware of planting trees, they merely serve to magnify the brevity of life’. Personally, I like to think I’m planting trees for posterity, but I did find Repton’s view refreshingly pragmatic! It was a memorable and very enjoyable day out – thank you Andrew, Patrick and John. I highly recommend a visit to the Repton Exhibition, which runs until October 28th this year. I also thoroughly recommend trying to recapture a little of that childhood playfulness that affected us all on the day - those three Wenham brothers were lucky to grow up in such proximity to a world-famous landscape and to be given the freedom to explore it. I know how grateful I am to have grown up in the Cotswolds, with grandparents living nearby in Laurie Lee’s Slad Valley. That landscape has stayed with me throughout my design life. In fact, I often find myself trying to recreate the atmosphere of my much-loved Grandparents’ orchard or the natural beauty of the wildflower planting in their meadow. As designers, the gardens we design become the settings for others to rest, play, grow, learn and live in. We are lucky to have the opportunity to enhance all those experiences. And look what well-rounded adults we grew into after our own childhoods were spent in the great outdoors! To find out more about our team at the Garden Company and the factors that influence our work, please click here. 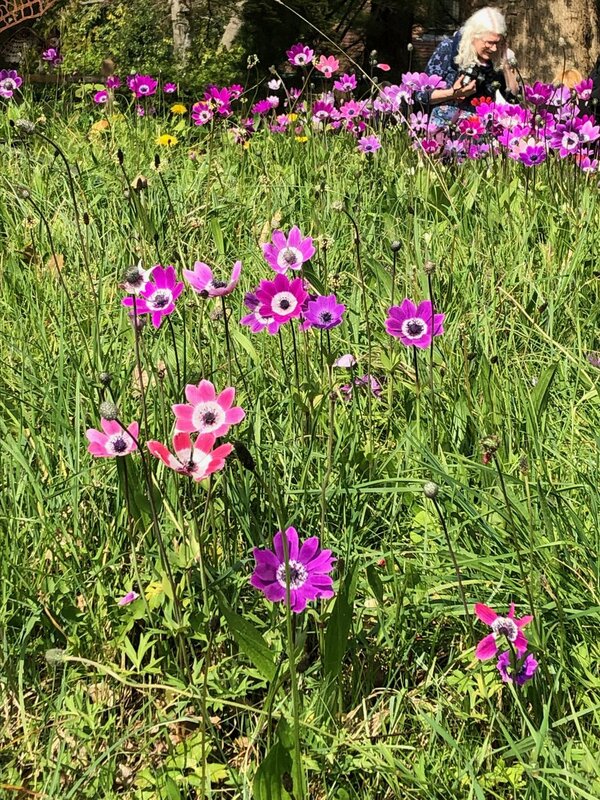 This entry was posted in Blog and tagged garden, maintenance on May 10, 2018 by admin. Whether you dream of doing the job yourself or not, we thought that ‘stepping into the shoes’ of a garden and grounds maintenance professional would provide some interesting insights. Who better to talk to of course than the Garden Company’s own Garden Maintenance Manager, Joanna Mège – we persuaded Jo to leave her sites in the capable hands of her maintenance crews and talk to us over a coffee about the ups and downs of her role. Jo joined the Garden Company four years ago and – with her team – provides a domestic garden and commercial grounds maintenance service to 50+ clients in Hertfordshire, North London and surrounding areas. Client sites range from privately-owned gardens (large and small) to business parks and public spaces. What has your career path been? I was born and grew up in Poland. I always loved the outdoors and much preferred helping at home in the garden than in the house! I have childhood memories of loving the fragrances inside a greenhouse or in a florist shop. With this in mind I decided to study Horticulture at University and completed a Master’s Degree. During this 5-year course, I arranged to spend a placement year in England. This was where I discovered ‘the English garden’ and I loved being here so much that I extended my placement into an 18-month one. After completing my Master’s degree, I moved with my husband to England where we both embarked on careers in garden and grounds maintenance. I spent 9 years at a garden design, build and maintenance company in North West London where I progressed to a leadership role. In 2014 I was appointed by The Garden Company to manage and develop its Maintenance division. What do you see as your main responsibilities and how do you spend your time? As Garden Company Maintenance Manager, I manage a number of maintenance teams who are dedicated to clients’ sites. I am responsible for drawing up weekly and monthly maintenance schedules that are tailored to every site, dealing daily with clients and their requirements, and making sure generally that the right people, equipment, gardening products and new plants are in the right place at the right time every day. I also handle enquiries from new potential clients as they arise and helping existing clients to develop their gardens through additional projects (e.g. new fencing, new planting plans). In addition to my own crew of Maintenance team leaders and team members, I work regularly with a close circle of specialists – for tree surgery, garden lighting and irrigation. In terms of my time, I spend some time every day on scheduling (and re-scheduling!). I like to visit every maintenance site regularly so that I am in touch with the clients and can coach and support our staff. I also deal with garden design professionals. Our landscape teams build gardens designed by our in-house designers and we also build for designers who don’t have their own build teams. We are then often appointed to maintain (although we like to think of it as nurturing) the garden. It’s really important that I understand the maintenance regime required and pass the knowledge on to my teams – that way the gardens develop as envisaged by the designer. When I’m in the office, of course I have routine tasks such as invoicing and payroll; in addition, I need to keep an eye on relevant Health and Safety legislation and statutory requirements, keep our ‘standard operating procedures’ up to date, stay in touch with our suppliers and take part in a company management meeting every month. Over the year, as the seasons change, different operational tasks will keep me busy – organising for bedding plants in spring, bulbs in autumn etc. What skills and experience do you think help you most in your job? I believe that the job requires a combination of solid horticultural knowledge with years of practical experience – it is the experience that helps you to know what to expect (not that you can ever predict exactly what will happen!). Every day is different – in a good way! Obviously, the seasons repeat themselves, but on a day to day basis there is a lot of variety in what I do and plenty of challenge – I don’t get bored. I love being outdoors, with a lot of freedom in how I organise my day and where I spend my time. I love working with plants – I really enjoy their colours and beauty – and seeing our clients’ gardens develop and thrive over time is a total pleasure. There’s a lot of job satisfaction to be gained from seeing our team members develop over time too. A large garden in Kings Langley maintained by The Garden Company’s professional gardeners. What’s difficult or challenging about your job? I enjoy getting everything and everyone organised, but then sometimes it’s frustrating if the plan falls through – equipment can go wrong and of course the weather can be unpredictable. But failure to plan in the first place wouldn’t be very helpful to anyone! Some of our clients are keen gardeners but many are not and sometimes this can be a bit of a challenge – people see wonderful plants in the garden centre or in a friend’s garden and may not realise that this sun-loving plant won’t work in their shady, woodland garden for example. I try to take the opportunity to explain to clients what will work best and also why – that’s also why plant knowledge is such a huge part of my job. What advice would you give to somebody who wanted to work in a similar role? It’s important to love gardens and to love being outside. It’s not a job for people who are too fond of being at their desks, you need to enjoy being ‘on the go’ and physically active. But you do need to be prepared to plan ahead too, to get the best outcome for every client. A plant identification session at The Garden Company. Building your plant knowledge is vital too, it’s surprising how many people don’t know the basics (even inside our industry). This is apparent quite often when we interview job applicants. There’s always more to learn too – that’s why we have regular plant identification sessions with the whole team at work, not just to reinforce plant names but also to learn key facts such as the best growing conditions, plants of seasonal interest etc. And as is true of any service industry, being able to communicate clearly and proactively with clients is essential. We understand how important our clients’ gardens are to them, and we genuinely welcome the opportunity to discuss any queries or overall plans for their garden and grounds. We don’t see ourselves as simply ‘maintaining’ gardens and grounds - we care for them and we nurture them. In fact, the end of a landscape project is really only the beginning of creating a beautiful place. 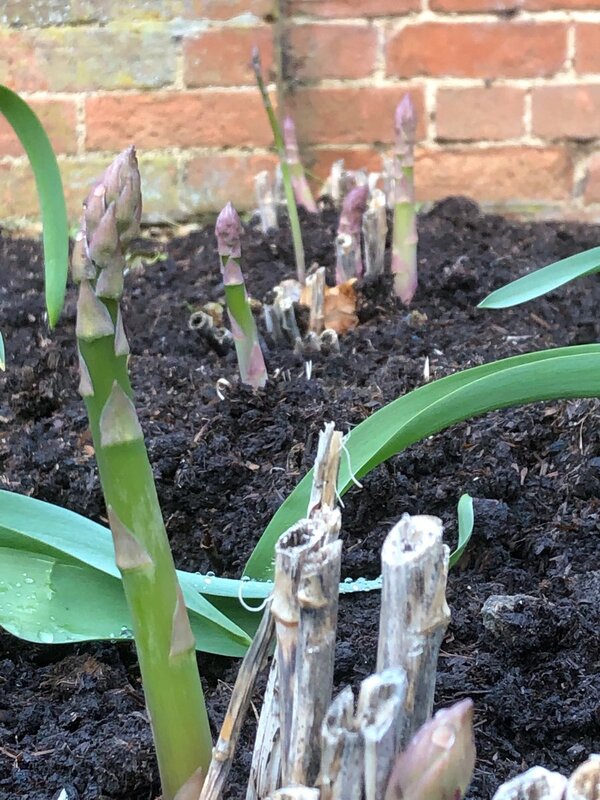 Joanna’s reflections on her role as Garden Company Maintenance Manager really highlight that garden and grounds maintenance is about far more than mowing grass and weeding borders (important as these tasks are!). Professional gardening services are based on a highly skilled process of nurturing and guiding a garden or outdoor space with foresight as it develops. Put another way, ‘Gardens are a process not a product’ – wise words from a former Head of Gardens at the National Trust, John Sales. If you are interested in beautiful gardens and would like to peek further into the world of professional gardening, you might like to get hold of a copy of Head Gardeners by Ambra Edwards. Featuring interviews with 14 Head Gardeners, it is a fascinating book and won last year’s Award from the Garden Media Guild for Inspirational Book of the Year. And if you are thinking about a career change into horticulture and related industries (or have a family member or friend exploring their career options! ), then take a look at GoLandscape. This is a careers initiative from BALI (the British Association of Landscape Industries), designed to inspire and educate new recruits and address industry issues, including skills shortages. As for the Garden Company, Joanna’s passion for plants and beautiful gardens together with her in-depth knowledge and skills means that she can add huge value for our clients and – importantly for us! – also coach and mentor her teams to do the same. You can see examples of the Garden Company’s maintenance work on domestic and commercial spaces here. Please leave a reply at the top of this blog post to share your thoughts. This entry was posted in Blog on March 5, 2018 by admin. Outdoor dining and entertainment is much more straightforward than building on extra rooms to the house. By simply incorporating the space you already have, you can easily install some appliances and have an operational outdoor kitchen – perfect for celebrating special occasions or just enjoying being outdoors. Everybody knows that food cooked outdoors tastes better – especially if an open fire is involved! I’m not sure of the science behind this but I know it’s not just about taste or even smell. Eating outside evokes memories and pleasant feelings since it —or at least the idea of it—seems to take us back to our childish selves: it feels ‘more playful, less formal and fussy, more exciting’ according to food writer and columnist Annalisa Barbieri - who also comments that ‘As a species, we love a fire; it taps into something deep within us, signalling protection, warmth, the ability to cook’. So that’s why even our teenage daughter will sit there and chat to us! And the cooking itself is different – simpler, often healthier and more reliant on fresh ingredients for flavour (possibly even herbs and vegetables grown right there in the garden). A spacious terrace provides the perfect place to unwind on a sunny afternoon, enjoy an evening meal with the family or a late-night drink with friends. 3. Some of us enjoy cooking for others! 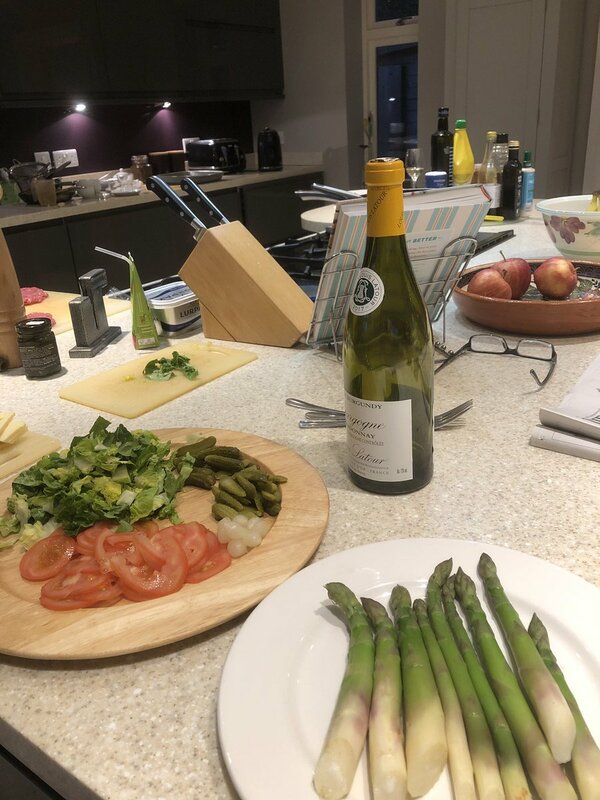 Not all of us, naturally, but I’m one of those people that really enjoys planning a menu, choosing great food ingredients (and wine) and preparing the food myself. Eating out at restaurants can be a lovely experience but on a regular basis it can also become very expensive and sometimes it’s not even that great. So ‘dining out at home’ offers you more control over the cost and quality of your dining experience (and for those with kids, it’s a huge saving on babysitters!). And while we may love cooking for others, not many of us relish the mess created by an indoor gathering – cleaning up after food and drinks outdoors can be a lot easier. Most of today’s barbecue grills and other outdoor cooking appliances are made from stainless steel, which makes them easy to clean. We recently designed and built a garden in Kings Langley, Hertfordshire where the overriding requirement from the client was to be able to entertain family and friends more easily outdoors. Our clients had a mature garden with some existing hedging and lovely specimen shrubs and trees. The clients enjoyed their existing garden but found it rather disjointed and lacking an entertainment area and further areas of visual interest. They wanted a stylish family garden with a large entertaining area including a swimming pool and pool building connected to the house. An existing unsuccessful oriental garden which could be viewed from the house also needed to be re-designed, and a new play area was part of the brief. Our ideas for the new garden design were based on creating a garden that appeared to be hewn out of the surrounding landscape. The scheme has specific divided areas to meet the client brief, with flow and connection between these areas to draw people around the whole space. For more detail and images, visit our website. In conclusion – we know that one of the main trends in current garden design ideas is the increased popularity of outdoor living and entertainment, despite our unpredictable weather. In my view, there are good reasons for this trend, including: being able to create more space for friends and family relatively easily (compared to adding on more room inside), enjoying the dining experience more (partly because of deep-rooted emotions linked to the outdoors) and the opportunity to prepare our favourite foods ourselves rather than rely on restaurant fare. If you are thinking about making better use of your own garden or outdoor space this year, I hope that this has been a useful read. In what ways are you already using your space for outdoor living, dining and entertaining? What creative garden design ideas could be applied to optimise your use of the space? If you are in North London or South-East England, please feel free to contact us with your ideas and let’s see how we can help. As a Registered Member of the Society of Garden Designers (SGD), I was delighted to be invited last month to comment on garden design trends for 2018. The article can be found here. I found it invigorating to read the thoughts of other professional designers and to reflect on the overall themes emerging. In this digital age when we are all spending more and more time at our screens, I believe that landscape and garden designers have a unique opportunity to re-connect people with nature, providing a rewarding route to emotional satisfaction and well-being. Yes, a successful garden scheme should look good, but most importantly, it should make the user feel good. As part of this re-connection with nature and the ‘great outdoors’, I anticipate that over the next 12 months and beyond we will all be ever more focused on enhancing the relationship between home and garden. Marrying indoor spaces to those outside to create flow, harmony and a sense of continuity throughout will underpin our work. In more specific terms, one of the broad themes in garden design over the next year and beyond will be our growing awareness of environmental and ecological issues. In my opinion, garden designers and clients have already been expressing their ecological interests and concerns through a wide range of choices in recent years. These choices range from planting lists featuring native species to locally sourced materials that fit comfortably within a setting. I anticipate that this trend will gather strength in 2018, with concern for local wildlife also becoming an even bigger part of the garden design concept. Big or small, a private garden or commercial grounds can be a healthy haven for wildlife in a wider network of places linking urban green spaces with the countryside. Many wildlife species are sadly in decline in the UK and there is growing awareness of the part our gardens and grounds can play in reducing this risk – through a host of measures including (but not limited to! ): replacing fences with green boundaries, creating ponds and water features, providing pollen/nectar-rich plants for bees and other insects, and planting wildflower borders and meadows. Despite our variable weather in the UK, outdoor kitchen areas will continue to grow in popularity, with dedicated spaces for cooking, eating and entertaining friends and family. Stylish garden furniture and a pizza oven or sunken fire pit will join the traditional barbecue as part of the setting for outdoor leisure time. For those with the necessary space and budget, eco-friendly garden buildings (not only sheds but also summer houses, studios, guest accommodation, …), outdoor swimming pools and swimming ponds that are designed to be a feature within the entertaining area will be a growing trend. As interest in the journey from ‘garden to table’ flourishes too, along with the growth in plant-based diets and peoples’ desire to reduce their supermarket bills, I also predict that more clients will ask us to add edible planting to their garden schemes – ranging from containers on balconies and terraces for growing vegetables and herbs to installing greenhouses for those with the space available. 1. On a practical basis, what does the client want and need from their garden or outdoor space? In other words, how will they use it & what do they need from their garden to make them feel good when they use it? 2. More broadly, what is the ‘sense of place’ that they want to create? This can be hard to articulate but it is vitally important as a designer for me to understand the combination of characteristics that will give a site its special ‘feel’ and help it to sit well in its surroundings. 3. What specific opportunities or problems are presented by the space? Naturally, this is where my own practical experience and knowledge can be combined with the client’s thoughts and ideas to identify possible solutions. If you’re planning a garden design project for 2018, then I hope that this blog has given you some food for thought. For more ideas, please see examples of our recent garden design projects here. Wishing you a very happy and healthy 2018! Merry Christmas and Happy New Year from the Garden Company! This entry was posted in Blog on December 21, 2017 by James Scott. The Garden Company team is grateful for another busy year of successful trading and delighted to send a Christmas donation to Perennial, the charity dedicated to people who work/ed in horticulture and are facing tough times. We know that this amazing charity makes a real difference to peoples’ lives. being shortlisted for two SGD (Society of Garden Designers) Awards. These are the only awards dedicated solely to landscape and garden design in the UK and are held in high esteem by design professionals throughout the UK and internationally. Being shortlisted for one (or two!) is a huge achievement and we are looking forward to a special night out at the Awards Ceremony in London in February. Having been the SGD Council Member responsible for organising this event for the last few years, I am greatly looking forward to just relaxing and enjoying seeing everyone there! Looking back over 2017, the other big project keeping me occupied has been to design and build a new garden for myself/my family. This has been an interesting and (almost entirely!) enjoyable experience. We moved to a new-build property in a small Bedfordshire village 18 months ago. The garden has a lovely old wall to the rear and a beautiful 80m long mature holly hedge along one boundary. Other than those existing features it was a blank canvas, which was perfect for me. Creating a garden for myself – plus other family members! – has been a great joy and reinforced how incredibly lucky I am to be in an industry where we can provide such enjoyment, and I believe, benefit the wellbeing of our clients. It has also been different to live with the space every day through the changing seasons and see the subtle changes, something I don’t experience in the same way with a ‘normal’ project, where I would perhaps visit a few times in the first year after completion. We started work on it just after Christmas 2016 and – one year on – the garden has been put into constant use over the summer and autumn. I look forward to sharing more images with you in the New Year (the snowy scene at the top of this blog doesn’t really give you much to go on!). I have really enjoyed maintaining and nurturing my garden – it does require attention and care. It’s reinforced my belief that designing and building a garden is just the beginning – the importance of skilled aftercare is paramount to the success of a scheme. As an industry, we need to raise the profile of aftercare and maintenance to make it a valued career choice. As professionals, we need to reinforce the value of paying properly for the skills needed and help clients to see it as more than simply ‘maintenance’. All that remains is for me to say a huge personal thankyou to our valued Garden Company clients, team members and business partners for your continued support and loyalty throughout 2017. And – of course – we wish everybody reading a magical, merry Christmas and happy, healthy New Year! The Garden Company office will be closed from December 22nd and we re-open for business on January 2nd. If you’re thinking about a landscape design or build project for next year, need a maintenance overhaul for your garden/grounds, or you are looking for an opportunity to work in garden construction/maintenance, we’d love to hear from you on 01442-832666. This entry was posted in Blog on November 24, 2017 by James Scott. Planting includes Echinops ‘Taplow Blue’. Planting includes: Acer ‘Senkaki’ and Cercis ‘Forest Pansy’. Planting includes: Aloe striatula and Cistus purpureus. The property was on a steeply-sloping site with excellent views of the surrounding Hertfordshire countryside and – in the distance – the National Trust Estate at Ashridge. The clients asked for ideas for deep borders with expansive planting, along with some less common and less hardy plants that could be over-wintered in a new greenhouse. The garden could be viewed from inside the house and these views were an important aspect of the planning. Framing and enhancing the impressive views over the Chilterns valley was another key design principle. The overall purpose of the design was to create a thriving garden that made the most of the sloping site and flowed cohesively from one area to another. Our planting ideas included specific plants that were chosen to echo the surrounding countryside and its ephemeral nature. Light and airy deciduous shrubs and textural plants were chosen for their skeletal effect, adding volume and creating separate areas that were still closely connected, and diffused by the taller plants rather than separated. These included Stipa gigantea, Foeniculum vulgare ‘Giant Bronze’ and Miscanthus sinensis gracillimus. Plants were also selected to soften the slope effect by forming soft curves and mounds rather than anything too rigid or formal, creating clumps of herbaceous plants, shrubs and grasses including Geranium ‘Brookside’, Cistus x purpureus and Sesleria heufleriana. Deep curving borders enabled intimate spaces to be formed throughout the garden. Carefully selected accent plants provided visual impact and added interest. These included Aloe striatula, Kniphofia caulescens and Dierama pulcherrimum ‘Blackbird’. Another level of sensory enjoyment was created by using scented plants including Rosa ‘De Rescht’, Viola odorata ‘Red Charm’ and Oenothera odorata ‘Sulphurea’. Kept from the original garden was a mature willow tree, which was pruned and crown-lifted. This added some character to the outdoor space while the new plants ‘settled in’. Every project brings its own challenges! In this instance, there were no significant planting restrictions owing to the light or soil conditions; the site was relatively open, with some shade on the southern boundary from neighbouring trees, and there was reasonable drainage, with shallow clay soil over chalk as is commonly found in this part of Hertfordshire. Actually, the main challenge we faced arose from sourcing some of the lesser-known varieties of plants on the plant list, such as Gentiana sino-ornata and Lampranthus spectabilis. Our plant suppliers (Joseph Rochford Gardens Ltd and Orchard Dene Nurseries) could not have been more helpful. Our clients were delighted with the completed project. The garden is full of interest in different seasons and is a lovely place for them to spend time in (mainly – as keen gardeners – with gardening fork in hand!). For more examples of planting ideas that we have implemented in Hertfordshire and throughout South-East England, please visit our design projects page. This blog is based on an article which originally appeared in the June 2017 issue of Pro Landscaper.